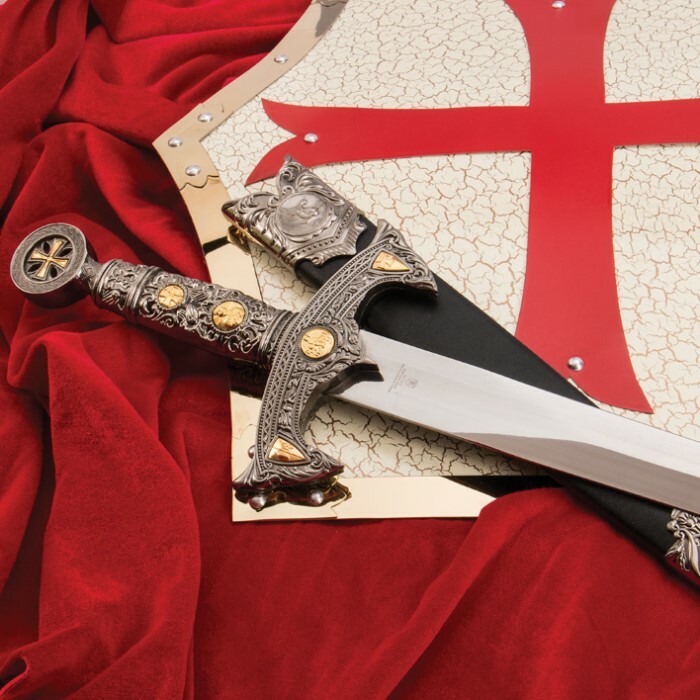 Knights Templar Sword | BUDK.com - Knives & Swords At The Lowest Prices! Good buy. The sword is well made with beautiful ornate trim. Works well. The sheath came without the metal ornate tip or collar and it is made of plastic. Great gift for my son He was proud to display the sword. Sword appears well made with attention to detail. Sheath holds the sword inside with a slight push. Looks great with my collection of my other BudK products. I got to say that I was a little disapionted of this sword. When I first got it I was still loving the sword but it is very small so now I just call it a dagger. Also it is very oily. 2: It's about as cheap as you can get a functional medieval weapon. 3: It fits tightly into the scabbard, so is relatively safe to carry around even without a peace tie. 4: It's very sturdy, and has a firm grip for an all-metal handle. 1: The chains on the scabbard are unforgivably fragile and may break just by walking around with it on your belt. 2: The handle is ridiculously short, and I have somewhat small hands for a grown man, so don't take that statement lightly. 3: The double bevel is not straight down the length of the blade. 4: You can easily notice the word "China" on one side of the blade. 5: For some reason, the blade smells like vapor rub. I think this is due to the chemicals the probably used to stiffen the leather in the scabbard, but I don't know. 6: The extremely recessed opening on the scabbard makes it hard to sheathe without bringing it right up to your face to see. 8: IT'S A DAGGER, NOT A SWORD! 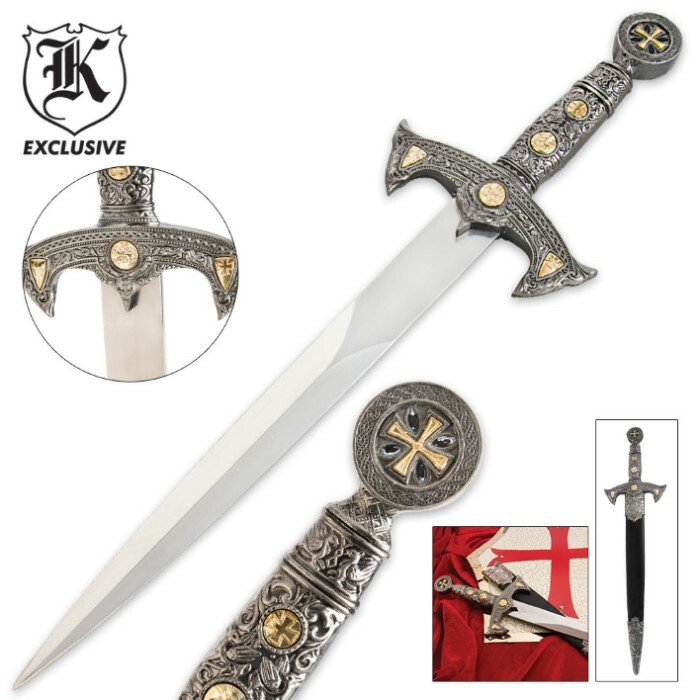 This website has a really bad tendency for naming its products for something much bigger than what the actual product is, and this "Short Sword" is no exception. All things considered, you can get much better daggers on this site or others for just a little bit more money, but if you're on a very limited budget and want something superficially attractive for a fancy dress party, this is almost worth the price. This LITTLE sword is great! 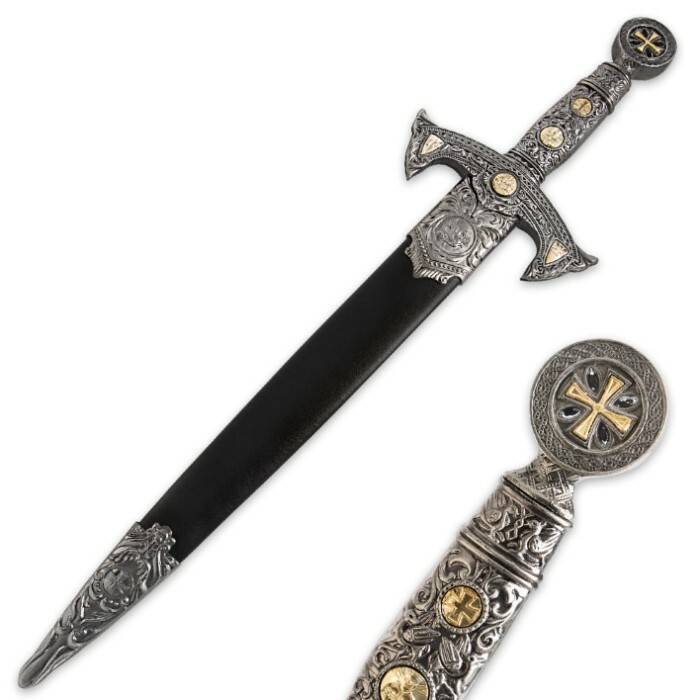 Even though it's more of a long dagger then a short sword (if you'd like to call it a sword, the correct title would be a "VERY VERY short - short sword" lol ) - I would love to see a full size version of this sword! (double the size would be nice) It has great detailing and is a good buy for $20. Smaller than I expected but beautifully crafted and expertly sharpened. A magnificent collector's piece.